Like tiny fowl smashing against the flimsy, precariously balanced fortresses of chortling pigs, the makers of Sony’s Angry Birds movie are gamely flinging themselves against the preemptively constructed opinions of chuckling know-it-alls, who say the brand is well past its cultural peak. With the determination of someone in a boring business meeting, they just keep at it—hiring talent like Jason Sudeikis, Josh Gad, Danny McBride, Peter Dinklage, Maya Rudolph, Bill Hader, and Tony Hale to voice those birds and pigs, and declaring that the 3-D CGI film will add new dimensions of spectacle and drama to your smartphone time-waster. And now they’re doubling down again, reportedly spending $185 million to make this adaptation of a $4.99 game the cinematic epic they believe it to be. According to Cineuropa (via The Playlist), Rovio Entertainment has budgeted $185 million total for the film due next year. A big chunk of that, around $100 million, will go toward marketing, in the hopes of raising awareness of a movie based on the most downloaded game of all time. Some of that will be aided—and offset—through new licensing partnerships that will expand the underserved Angry Birds merchandising market, which currently consists only of TV shows, toys, comics, board games, clothing, shoes, diapers, jewelry, cosmetics, bedding, linens, kitchenware, home décor, garden and lawn decorations, health and dental care products, school supplies, party supplies, travel accessories, paperback novelizations, cookbooks, cell phone accessories, assorted electronics, sports equipment, office supplies, automotive gear, hardware, collections of music, soft drinks, candy and snacks, dog and cat toys, and, of course, Angry Birds fragrance for both men and women. These new partnerships will finally allow Angry Birds to enter new, untapped markets, like Angry Birds-branded medical supplies and estate planning. In fact, one of those new licenses was announced today: a partnership with Global Eagle, which will integrate Angry Birds into the seat-back entertainment systems of the more than 100 airlines it services. After all, what better way to pass the time on your flight than playing a game where airborne things repeatedly crash into other things? “You can accuse us of many things, but not of lack of courage,” Rovio CEO Pekka Rantala said of his company’s brave ambition to keep slapping its most successful product on everything, including a $185 million movie. Who’s going to stop them? You, chortling pigs? 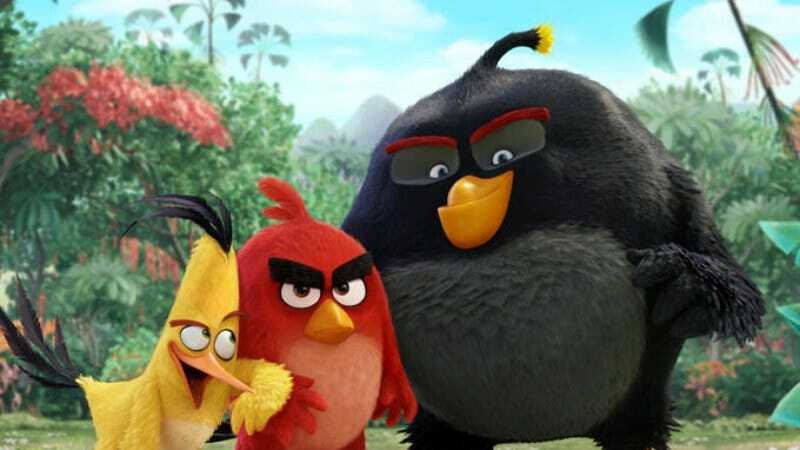 Anyway, with that $100 million going toward really getting the Angry Birds name out there, the rest will all end up on screen—with approximately $2 million going towards the actual animation, and the rest going toward buying hundreds of birds, then training them to be really angry at pigs so they can more accurately capture their reactions. And it will all be totally worth it.